B: Richard Bram: What Was He Thinking? "As a general note, I rarely go out looking for anything specific other than always having a camera with me, and trying to keep aware of what's going on around me. Most of my photos are made while I am just passing through. I don't shoot many frames of any particular scene as there isn't time to make more than one or two when I see a potential something. I find that if I'm really working a scene, shooting lots of frames, there is rarely anything there when I look at the contact sheets. I'm an editor as much as a shooter. I do think when I shoot, but think hardest when I'm looking through the contacts and see what the final little rectangles look like." "In September, 1996, I was in Germany as part of a Sister Cities' exchange program between Mainz and my then-home of Louisville, Kentucky. 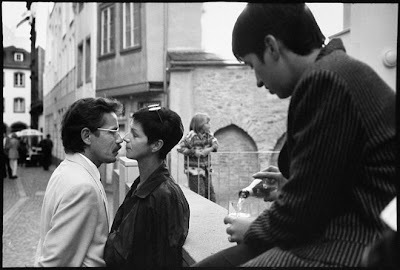 I'd been shooting on the streets of Mainz for a week. At the end of the art festival there was a competition followed by an awards ceremony. Drained from trying to follow lengthy speeches in German, I walked outside into the street for a bit of fresh air and immediately felt the emotional intensity, the heat of this couple gazing into each other's eyes, not kissing but clearly oblivious to all around them as I took a couple of frames. They and their gaze, noses touching, are in sharp focus - all else is softer, intensifying the feeling. I took two frames, the first a bit farther away. Their eyes are open and there is no one else in the frame and it's nothing special. As I moved a bit closer a moment later, the other people moved into the picture and it took life. There was just enough time to take a similar frame in color. (At that time, I always carried two camera bodies - one color and the other black and white.) The color photo is far less satisfactory - the little girl in the center background is wearing a brightly-colored jacket of pink, purple, yellow and red and the eye goes immediately to her, although she isn't important to the visual narrative. As someone said 'In black-and-white you look at the faces; in color you look at the clothes.' "
"By March of 1998 I was living in London. Going home one afternoon, I went down onto the Underground platform at High Street Kensington station. Just up the platform I saw the man in the dark coat in front of a vodka poster and realized the possibilities. In exactly the right spot to make the photograph work was a group of three or four people who noticed the same thing. As I moved up to them quickly, one said 'Look at that - don't you wish that you had a camera?' I said 'I do have one and I have to stand right there! Please excuse me.' 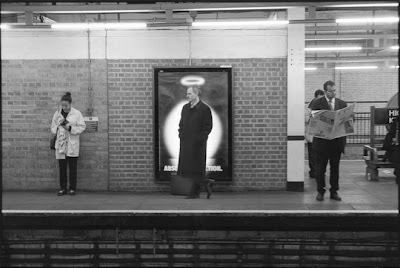 Bemused, they made room for me and there was time to make four frames before his train came and the angel vanished. An interesting follow-up: In early 2001 I was asked to join in-Public.com. Shortly after, we were featured in a series in The Independent newspaper here in London, and they ran this photograph. A couple of days later I received an e-mail from a man through the site asking me the circumstances of the photo and wondering if it might be him. His brother had seen the image and pointed it out. I replied and we had a pleasant phone call about it. I sent him a fine print and have not heard from him since, though this photograph has become one of my signature images. It is rare that one has the chance to encounter someone photographed in the ambience of street life, as most of my subjects don't know they have been photographed until after the exposure has been made, if at all." "This photo is an exception to my opening remark. In early March 2003, I'd gone up to Oxford Street on the first pleasant day of the year to intentionally work the shoppers. (It must be said that I was badgered by Matt Stuart, David Gibson and Nick Turpin, all of whom were out shooting on Oxford Street that day.) I went through about three rolls of film in a couple of hours. We had joined up for a moment in front of Selfridge's and were sitting on a bench talking. As we sat, this lovely woman stopped in front of us and I made a frame. She then threw her head back, reveling in the warm Spring sun. I made two more; she lowered her head and went on her way. 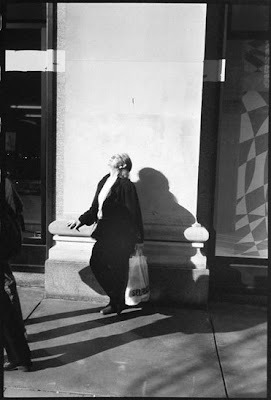 It was by far the best of the day, for the emotional moment as well as the visual elements of the shadows on the pavement and on the pilaster behind her." "This is one of two frames from January 2003. 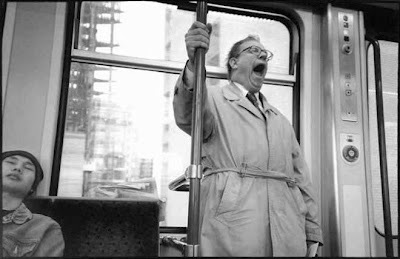 It was that time of the mid-afternoon when nearly everyone gets a little drowsy and I was on my way into Canary Wharf. The first frame was of the young man on the seat snoozing, but wasn't really interesting. As I took it, though, I noticed the standing man yawn. Feeling very sleepy myself, I thought it might happen again, and had my camera ready when, as I'd hoped, he yawned again. I love this photo - it just says 'It's nap-time.'" 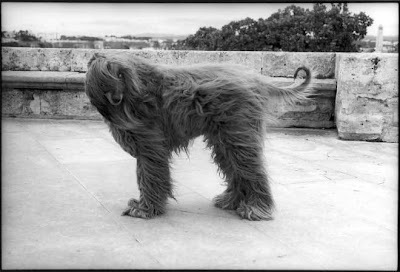 "While attending a friend's wedding in Montpellier, France, in April, 1996, I saw this Afghan hound padding by on a windy day. He stopped, looking back and waiting for his master. The way his hair was blowing in the wind made me laugh. I took one frame. He seemed put out that his dignity was diminished by the breeze. Even dogs have bad hair days. Since Elliot Erwitt published his nearly-encyclopedic compendium "Dogs Dogs," it has been hard for anyone else to show a dog photograph. But the beasts are everywhere, in all sizes and shapes and hair-dos. If one is to photograph life, there will be dogs." "Like the Angel, this one was a gift from the Gods. My wife and I were heading down the escalator at Bank Station to go to dinner. She saw the couple first and elbowed me. I had just enough time to focus and shoot one frame as the escalators quickly drew us together. 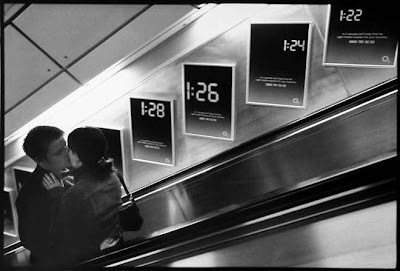 Only later on the contact sheet did I really see the countdown posters on the wall that make the photograph rise above being just another photo of people kissing. I began my photographic career in Louisville as a public relations photographer specializing in big public events. Placing an event sponsor's banners in the background of a shot made me aware of signs, posters and billboards behind the protagonists in a photo. When shooting for myself, I still notice these things and they often can make the photo. The hard part of this is that the poster must integrate into the narrative of the image and not be the subject itself. It is all too easy to descend into cliche, into a photograph that is just a 'one-liner.'" 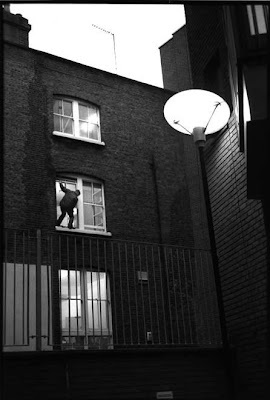 "One evening in March 2004, after dropping off some film at Metro Imaging in Clerkenwell (I haven't hand-processed film in many years) I was walking back to the Tube through a back courtyard. This man hanging outside a window immediately caught my eye. Out of curiosity - what was he doing? Burgling or perhaps just fixing the window? - I got as close as I could and took 4 frames before he ducked back inside. I love the ambiguity as well as the way he nonchalantly stood on a tiny ledge outside of a window three floors off the ground. As I looked at the enlarged photo later I realized it was the latter - he was working on the windows as part of a renovation. But there is still a mystery to the photo, perhaps brought on by the darkness, by the scale of the streetlamp in the foreground or the converging verticals that makes it one of my favorites." More of Richard's work can be seen here and here. I've met Richard Bram....even been in his home in London. I've lost contact with him but would like to say "hey." So Richard if you read this email please. Amazing moments and fine stories. thanks. Been a fan for a long time. He keeps improving. The arrogance of youth replaced by the wisdom and humor of experience.